Ring and pinion gear sets are uniquely designed to match the requirements the OEM designated for your specific vehicle. All performance factors for the size and weight of the specific vehicle must be taken into account. Our innovative "Two-Cut" manufacturing process ensures the lowest tolerances possible for the quiet operation required by our OEM customers. 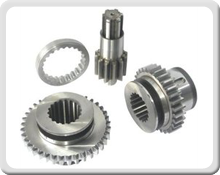 The combination of materials, heat treating and cut geometry allows for a gear set that has ten-times the life of a non-OE gear set.